! !Register 113.226KM before 2018 5/31 can get free CT Tri Backpack!!!!! There's no doubt that Challenge Taiwan 2018 was the best triathlon event have ever held in Taiwan! The marketing before the event, the planing of the race course, the arrangement of the supplement,... If you didn't participate 2018, you must join next year! Great event, looking forward to the next year. Excellent event, I will miss it very much. Very satisfied with Challenge Taiwan event, this is the highest standard, the most diligent event, thank you! The swim course is set for Flowing Lake in TaiTung. The two-lap swim is in a man-made reservoir with easy views for spectators to watch from the shore. The course starts from a pontoon in an anti-clockwise direction with a total of two turn buoys. The average water depth for most of the course is 2.5m. The swim course is in crystal clear water from a natural spring and mild temperatures. Wetsuit: to be confirmed at race briefing. Event swim cap: compulsory and is provided at registration check-in. Exiting the swim course at Flowing Lake, you will need to collect your T1 (swim to bike) bag and proceed to either the men’s or women’s changing tents. Once you have changed into your cycling gear, please place all of your swim gear in your T1 bag and leave at the collection point. One of the Volunteers will collect your T1 bag which will be placed at your bike. Bikes will be pre-racked (by you) the day before the race in numerical order. Your helmet must be clipped on before unracking your bike, and you must proceed on foot to exit T1 and head out onto the bike course. The bike course is set on an undulating two-lap course which heads north between the soaring Carp Mountains and spectacular Pacific Ocean coastline. The course heads out of town over ZhongHua bridge and hits the coast shortly after XiaoYeLiu. After which it continues along Taiwan’s beautiful east coast rolling through Doulan and turning around BaWonWon to head back to TaiTung city to then turnaround for a second lap. Aid stations on the bike will be approximately 20km apart. These will have bike bottles with sports drink or water in them. Energy bars, salty snacks and bananas will also be available from specific aid stations. If you are caught drafting you will be penalized and/or disqualified. Please attend the Race Briefing for clarification on our drafting rules. Once you come to the end of the bike, you must dismount before you enter T2 and walk your bike to your numbered rack. You must once again collect your T2 bag (bike to run) and proceed back to the men’s or women’s change tents to prepare for the run. Once again, put all of your cycling gear in your T2 bag and leave it at the collection point where our staff will collect it and place it at your bike after the race. The run combines the cultural heart of Taitung city with the beautiful Pipa Lake Park, the surrounding tranquil rice fields and orchards and vibrant ocean promenade. Aid stations will be positioned approximately every 2.5km on the run. They will be offering a variety of sports drink and foods. Tie Hua Village, a vibrant destination in the heart of downtown Taitung, is filled with colourful and musical aroma. You can hear the melodies of the aboriginal culture from a distance away. Lined with a sea of colourful hot air balloon lanterns, this is the place to be in Taitung for a relaxing yet energetic atmosphere. 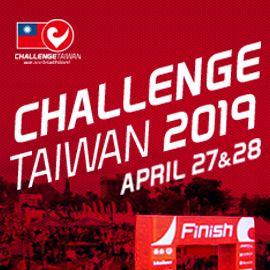 As you come up the finish chute, take a little time to reflect on what you have achieved, and relish the experience of finishing Challenge Taiwan. More detals please see our website.